Please complete this application thoroughly. Incomplete applications may result in a delayed response time. Application must be completed online via this form. Do not email, snail mail, or hand deliver your application as we will not be able to process it. Indoor Exhibitors (Comfort & Convenience) may give away small food samples, product samples, and sell products and/or packaged food that is not meant for consumption at Veg Fest. All samples, products and marketing materials must be vegan. No propane or cooking indoors. Each Vendor must bring their table. 2 chairs are provided for each indoor vendor. Because our vendors are representing the VegFest, please only sign-up if you already vegan. Please bring only one 6' table per booth space. Booth size is approx 8’ wide x 6’ deep. ALL VENDORS MUST BE FULLY SET UP BY 9:30AM. *Local Small Business: We offer a discounted price to small businesses that are not a part of a large corporation. This discount is only for indoor vendors. Food Vendors: Pop-ups and Food Trucks will be outside (no equipment provided). Be sure to bring long extension cords to hook up and clearly define your electricity requirements in the form below. Late Donation: You may add the late donation in the donation field at the end of the form if you are applying after the late application date. We offer great discounts on vendors who need a bit more space. Pay only 50% for additional booths. Please give us a quick overview of what you will be showcasing in your booth. Central Coast Veg Fest/Central Coast Vegans 501(c)3 will have a group County Health Permit for the entire event--this will waive your need to get a permit. The Health Permit requires you to donate your self-declared profits to the event at the end of the Veg Fest. If you are Providing Samples, please describe them. If someone referred you to us, can you please share? Is this your first CC Vegfest? Thank you for joining us again this year! Is there any feedback you have for the CC VegFest team which would help us make the event even better? Is there a specific location which you would prefer to be placed, or is there a friend's business which you would like to be near? Non-Profits Please mention if you prefer to be indoors or outdoors. We cannot guarantee placements but we will do our best. If electricity is needed, list the devices and amps required. Indoor Vendors: Simple electronics are not of concern such as laptops, tablets or cell phones. We need to know about electronics that are high wattage. Note that we cannot guarantee electrical outlets for each exhibitor. We will prioritize food vendors and then reserve outlets for exhibitors on a first-come, first-serve basis. We will let you know whether we can meet your request. Be sure to bring extension cords and power strips in case you need to share with a neighboring Vendor. No butane burners allowed indoors. Outdoor Vendors: Power is very limited outside and we traditionally do not provide power to outdoor non-food vendors. Please contact us if you need power outside. Sponsoring CC VegFest is a great way to promote your organization. 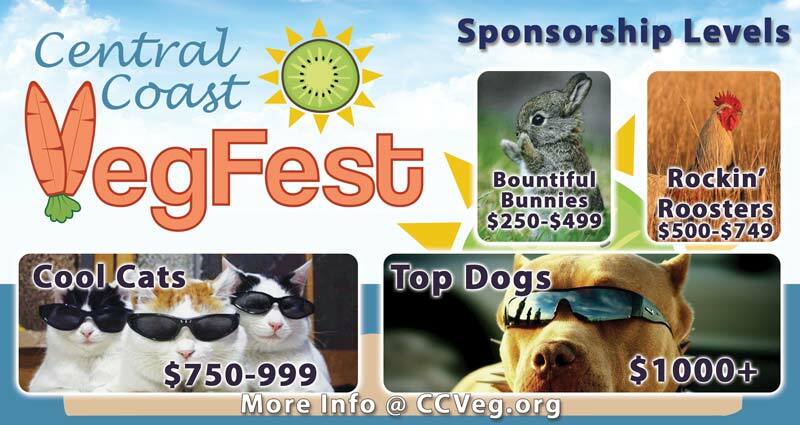 Please email us at vegfest@ccveg.org if you have any questions about sponsorships. Interested in sponsoring CC VegFest? <--- Check to box to learn about Sponsorship Packages. Central Coast Vegans is a 501c3 Non-Profit. Your Donations Are Tax Deductible. If you are unable to represent your organization at Spokane VegFest, we offer to staff your table with volunteers for the day. You should send all supplies needed and an information sheet with talking points, answers to common questions, etc. that we will give to the volunteers to support their company during the day. Yes, A representative from our organization will be there the entire day. No, we will need a volunteer. Would you like volunteers for your booth? We ask for a $60 donation for each volunteer for the day. We charge because we have a very limited number of volunteers. Would you like to donate a bit extra to help us put on this community building event? Please initial agreement with your mouse or draw on your screen for every term and then sign at the bottom of this page. In this agreement, "Vendor" refers to any Sponsor, Vendor, Business or Organization selling or giving away food or products or presenting information at a booth or stand at Central Coast VegFest. "Central Coast VegFest" refers to the organizers of the event as well as the parent organization Central Coast Vegans. In keeping with Central Coast VegFest core principles, all items displayed, advertised, sold, or sampled during the event may not be or contain any animal products. This includes but is not limited to: meat, poultry, fish, dairy, eggs, honey, gelatin, shellac, and other animal- derived additives andor products. This also includes items made from or with animal fur, leather, hides, feathers, wool, horns, shells, bones, silk or any type of animal product. Merchandise should not be tested on animals. Violators may be removed from festival upon inspection and booth will not be refunded, if unwilling to remove animal derived items. Each exhibitor must submit an individual application and payment. Payment is required to hold space at event. Applications without payment will be void. NO Refunds unless Vendor's application has been rejected by Central Coast VegFest. Contact us if you need to cancel your spot and we may offer a 1/2 refund on a case by case basis. Should any contingency interrupt or prevent the holding of Central Coast VegFest, including but not limited to inclement weather, war, terrorism, or lockouts, the event coordinators and Central Coast VegFest shall in no way be liable to exhibitors. Should any contingency prohibit the event from taking place as scheduled, event coordinators will make their best effort to reschedule the event on a weekend day as near to the original date as possible. Vendor information, agreement, payment, and contract are submitted via Vendor online portal. Full payment must be made by 3 days before event including any late fees. Vendor booths will be subject to Central Coast Vegfest's final approval & space availability. Central Coast VegFest reserves the right to accept or decline any application at its discretion. The number of spaces is limited and will be filled on a first-come, first-served basis. Indoors booths: appx. 10’x8’ space. Central Coast VegFest will provide 6' or 8' tables and 2 chairs. Vendors should provide their own tablecloths and booth decorations such as pull up banners. Outdoors booths: 10'x10' space - Vendors are responsible for the entire set up from canopies to furniture. If Vendor brings their own canopy, Vendor must ensure that their canopy is flame-proof, secure their canopy with sandbags or concrete blocks. Central Coast VegFest will not provide Vendor with any items or services outside of access to electricity. Setup begins at 7:00 am. Exhibitors must be ready for operation by 9:30 am. Exhibitors must staff their tables during the entire event from 10:00 am to 5:00 pm. Vendors are responsible for setting up and tearing down their OWN equipment. Vendor spaces must be surrendered in the same condition in which they were when received. Electricity will be available to indoor booths at a first come first serve basis. Please let us know if your electrical devices require anything other than a standard electrical outlet. If you need to hang a banner, you need to supply your own banner stands. Banners cannot be attached to any walls, trees or buildings. Exhibitors must have clearly displayed signs, which identify name, products, and prices where applicable. No Vendor may break down booth prior to 5 pm. Central Coast Veg Fest/Central Coast Vegans 501(c)3 will have a group County Health Permit for the entire event--this will waive your need to get a permit. If you are serving food of any type, outdoors or indoors, you agree to follow all rules set by the county health department and provide your self-declared profits at the end of the day. Styrofoam can NOT be used for the attendees. In order to present a green event and to reduce trash, food samples should have minimal packaging and compostable utensils to be used. Vendors agree to make no claim for any reason against event staff, coordinators, volunteers, Central Coast Vegans officers, Central Coast VegFest, and Cuesta Community College for loss, theft, damage, or destruction of goods, nor for injury to themselves, employees, volunteers, or visitors incurred at the event. Vendors will not interfere with the safety, success, and effectiveness of VegFest. This includes, but is not limited to, behavior, display materials, literature, venue equipment, or operations, unusual odors, or extending beyond Vendor space and/or blockage of public passageways. Vendors may not solicit/sample to/or petition attendees beyond the confines of their booth. Music and/or recordings must not interfere with neighboring booths. Vendor agrees to comply with all the regulations of the facility hosting the Festival and all federal, state, and municipal laws, including health and safety. Vendor agrees to be responsible for collection and reporting of sales tax as required by law. Vendor shall be responsible for obtaining all licenses, permits, health certificates or items required by governmental agencies in order that Vendor’s booth/concession may be lawfully operated. Central Coast VegFest has full authority to stop Vendor from operating, without refund, should Vendor sell or promote products and/or services other than those stated in Vendor’s application. Vulgar, Offensive, Sexually Explicit, or Obscene materials as judged by Central Coast VegFest, and such judgment shall be final. Vendors shall not share or sublease any part of their booth space for any other business. Vendor shall not modify, adjust, damage or remove any part of their booth. Vendor may be requested to remove a product or service displayed at the Festival at the sole discretion of Central Coast VegFest if deemed unsuitable by Central Coast VegFest, and such decision shall be final. Vendor agrees that Central Coast VegFest shall not be liable for any damages or losses, pecuniary or otherwise, foreseen or unforeseen, incurred by Vendor as a result of such action. Vendor is prohibited from soliciting, selling, and promoting its products/services, including but not limited to, distributing fliers, greater than ten (8) feet around Vendor’s booth. Vendors using amplified sound must place their sound systems within the rented booth space, and the sound level shall not exceed 30 decibels. Non-compliance with these rules pertaining to amplified sound, after the first warning, shall result in expulsion of vendor from the festival. Vendor agrees to be held responsible for Vendor’s (and Vendor’s staff’s) own actions within Festival grounds that may result in additional fines by the city, county, or other levels of government, i.e. oil spills. Vendors agree to permit photographs and video to be taken of them, their volunteers, and their booths at Central Coast VegFest, to be used for the purposes of future promotion and advertising of the event. All photographs/video footage will be the property of Central Coast VegFest. Central Coast VegFest reserves the right to remove any Vendors from the Festival. Central Coast VegFest may take photos and video of you and your exhibit table and use it for our promotions. (Recommended) SOCIAL MEDIA – Please take a moment to share the Facebook event on your social media accounts. The more people that know about Central Coast VegFest, the bigger success it will be. Thank you. Facebook Event - Please do not create unique Central Coast VegFest events but instead add the official Central Coast VegFest event to your company calendar. Central Coast VegFest is both a celebration of veganism and a place for information about plant-based living. With this double function in mind, Central Coast VegFest recognizes the necessity of graphic imagery as an education tool, but wants to maintain the idea of celebration. We allow graphic imagery, but please keep the following guidelines in mind: Any graphic imagery that attendees are forced to see is not allowed. If literature has a graphic image on the front page, we ask that it be hidden by a blank piece of paper. Graphic images inside of literature are acceptable and may still be distributed (please specify in the product description). If you have any questions, please contact us. We reserve the right to disallow any graphic imagery that does not fit within these guidelines on the day of the festival. This agreement states the entire contract between, Central Coast Vegans/Central Coast VegFest and the Vendor. No changes will be valid unless agreed to by both parties in writing. You may either send us an electronic payment through paypal using your credit card or mail us a check. After you click Submit, you will pay this amount on the next page using Paypal, Credit Card or mailing us a check.